Part 1: How new approaches to advertising can win friends, influence customers and make you money. 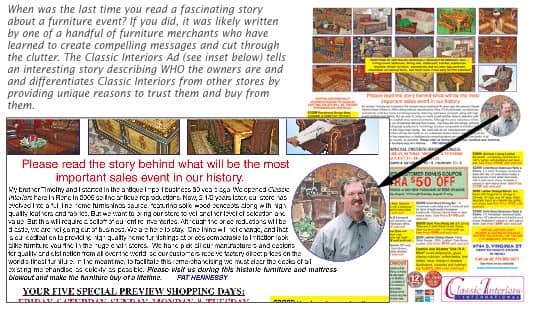 Editor’s Note: Ten years ago, marketing feature editor Larry Mullins wrote his first series of articles for Furniture World, titled The Seven Lost Secrets of Successful Furniture Promotions. Times have changed since that popular series appeared. Although the principles that drive good advertising are still valid, the application of these principles requires adjustment. New media are available today for the alert furniture entrepreneur. In this article, Larry introduces the series and gives independent retailers some valuable insights in advance of the formal introduction of the Updated Seven Lost Secrets in the December/January issue. It’s the best-kept secret in modern furniture marketing: You can use affordable media more effectively, in ways the big boxes cannot. 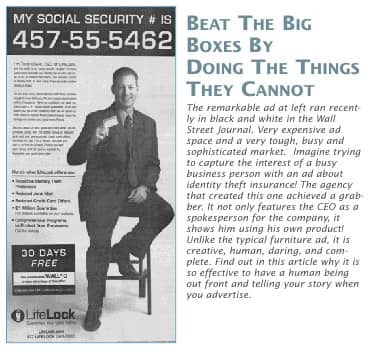 Big boxes can’t seem to create advertising that tells their story with compelling copy. Nor are they able to teach locally owned stores how to do it. But you can begin today to apply new approaches to advertising that will tell your story and increase sales. So, what’s the catch? The catch is you must have a compelling story to tell. Which, of course, you do. But you may have come to believe that no one is listening. The intuition that no one is listening is correct when it comes to typical approaches to advertising. We are facing the most massive information glut in the history of the world. People are filtering out all the gimmicks and intrusions of typical advertising messages. There are just too many of them. Now, why would someone who makes their living by creating advertising programs be telling you this? Because it’s true. I used to say that it was necessary to revise advertising approaches every five years because even great strategies stop working after a while. Now they must be revised every three years. Remember NO-NO-NO credit offers? They are ho-hum table stakes now. It is time to demote them from headline to secondary status. TV ads are now generally a hopelessly outdated, linear, intrusive medium that customers can easily filter out. 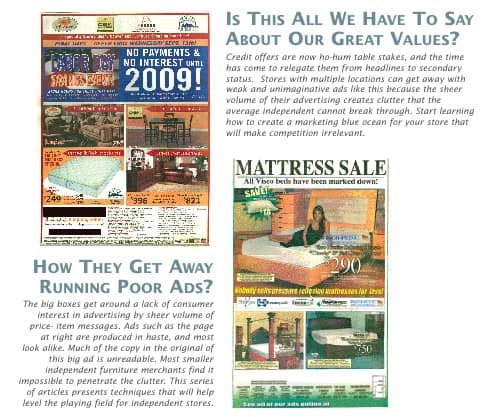 Newspaper ads, flyer inserts and direct mail appeals no longer work for most stores because writing creative advertising messages is a lost art as far as most retail businesses go. The furniture big boxes manage to get around this lack of consumer interest by sheer volume of price-item messages. Flyers created by the big boxes are mass-produced in haste and most look alike. But since mediocrity is the standard today, they manage to dominate the market. Most smaller independent furniture merchants find it impossible to penetrate the clutter because they can’t afford 10% ad budgets. Even if they could, they also lack the ability to create compelling advertising messages that sell. So where have the great retail ad people gone? The ones who know how to excite customers and get response? They are either working for top agencies or writing for direct mail advertisers like Sharper Image, LL Bean, and the airline Marketplace magazines. These masters of copy write interesting stories and sell tons of merchandise. They can measure results with micrometric precision and if they fail to produce results they are out on the street. When was the last time you read a fascinating story about a furniture event? If you did, it was likely written by one of a handful of furniture merchants who have learned to create compelling messages and cut through the clutter. No one can sell better than a hungry, skilled merchant who simply must be effective. “But,” you might respond, “people don’t read anymore. Especially young people. Right?” I can answer that one in two words: Harry Potter. Of course people are reading, but they are not reading your ads or flyers. People don’t particularly like to read or watch ads. But they love stories. The problem is your messages aren’t relevant to their needs so they don’t stand out amid the information glut and advertising clutter. They look and sound just like everyone else’s. My promise to you is that if you pay attention and read this series of articles, you will learn how to use the advertising that you can afford more effectively. You will also get the information you need to define your story and begin to tell it in a compelling way. Hot shot marketers today use the buzz word branding to describe your story. When all is said and done your Brand is simply the means by which you define and express (in a conceptual way) what you do and who you are to prospective customers. When done successfully, when customers see your logo, it will trigger visions of all the great things you can do for them. How is this done? Plato knew. “Know thyself,” he said. You are in a noble profession. Other furniture stores sell home furnishings. But you do more. You make people’s homes more beautiful and comfortable. You have a passion for impacting people’s lives in a positive way. Other stores sell sofas and chairs, but as one of America’s top furniture professionals you are, as George Silverman puts it, outrageously better than the competition. More about him later. You and your team have so much more to offer people. Isn’t it great that you can provide a thrilling shopping experience that exceeds the expectations of guests in your store? Isn’t it exciting to be a contributor - an agent of positive change – and a creator of value in this world? But that is just the beginning of the story you have to tell. If they would only listen, you could hold an audience of guests spellbound with your knowledge of home furnishings. You also have a staff of sales consultants that you have trained to know that effective furniture marketing is something you do with people, not to them. You pay your bills and deliver merchandise on time. And, above all you have a reputation of keeping promises and striving to achieve customer satisfaction, in price, in value and in service. No ifs, no ands, no buts. No small print. There is only one problem. Your story is lost in the clutter of a mass of mediocre advertising by the big boxes. No one is listening, or so it seems. So you have stopped telling your story. But somewhere, deep within, you know there must be a “blue ocean” where your organization can thrive. And you are right. The purpose of this series of articles is to tell you exactly how to escape the bloody shark tank of ruthless competition and find that unique blue ocean where you will make competitors irrelevant. About ten years ago I discovered a secret. 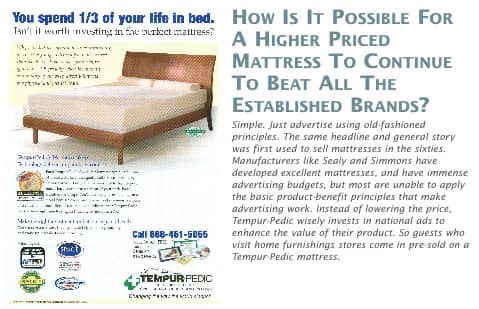 High impact advertising programs get great results for furniture retailers that have a great story (like the one above). The events are only so-so if the furniture entrepreneur doesn’t have a great story or lacks credibility with the public, his team, vendors and the community. Now, this secret of telling the story is very important. A great story is critical to a successful promotion. But it is very difficult, even when dealing with a top furniture professional, to discover their story and learn their unique factors. Fortunately, there is a step by step way to do this. Creating effective ads depends upon five basic factors: WHO? WHAT? WHEN? WHERE? HOW? And WHY? (Yes, just like Journalism 101.) The key component to this formula is WHO? Not simply your logo or sig. The big boxes make that mistake. They want their logo to be featured large and include some innocuous slogan (a catchy one of course, but one any other store could use). This is not branding. You want to say favorable things about your store that are relevant to the customer, and things no one else can say. That is professional branding. Example: At a recent sales meeting for a store that was all Ashley (not an Ashley Furniture HomeStore) two home specialists performed a role play. It was excellent, with a single exception. When asked what she was interested in, the role play guest responded that she wanted a child’s bedroom. Since this was the very first time Ashley as a brand came up, it would have been much better if the response had included a phrase along these lines: “This group is made by Ashley, America’s number one brand of home furnishings.” Why? Because no other brand can say this! Of course, this is branding Ashley, not the specific store. If you are an all Ashley store, or even an Ashley Furniture HomeStore, you are likely an independent entrepreneur who is embedded in your community. How can you brand yourself in a more exclusive manner? If you operate such a store you might describe it as: “Your friends and neighbors with national buying power.” Home specialists can add a benefit line when talking with guests: “This permits us to offer you hometown service and unprecedented value.” Later in this series we will discuss this technique in greater depth. There is still much more to the WHO? factor. Always use photos of the manager or owner. Why? Because your customers may have trouble forming a relationship with a logo. Research by Beemer suggests that customers are honored when they are waited on by the owner or manager of a store. So, talk to me as a person in some of your ads. Show me what you look like. And there’s more. What does your store look like – outside and inside? Do you have a website? When I call you in off-hours do I get some kind of relevant message? Or does the phone just ring? What about your staff? Are they trained to serve me? Do you have any kind of community involvement that indicates what kind of people you and your team are? Are you and your team especially good at anything? What kind of a satisfaction guarantee do you provide? Oh, by the way, how long have you been in business? This is very important. For some reason, very few furniture stores mention this, and often staff members in these stores don’t even know. Now, if I were a competitor who just started up, I would be overjoyed every time you ran an ad without informing the consumer about your longevity in the community. I would be thrilled every time a sales consultant failed to mention this unique factor to a guest. You just gave away one of your most powerful unique factors! You could say, as many tired furniture entrepreneurs do: “Look, how much difference can something like this make?” Because most of these guys don’t think it’s worth the trouble. The fact is that you can make your ads better by simply adding small elements. Each of these will increase their effectiveness by a fraction of a percent. These tiny improvements add up, and when you hit critical mass, an ad will become exponentially more effective. In this series we will look at exactly how you can do this. “All good selling is serving” said Clyde Bedell to furniture merchants during the fifties and sixties. Then the intense marketing wars began. In the last quarter of the 20th Century we were told that marketing is like warfare. The way to win is through predatory marketing skills. Customers became “targets.” My take-home message to you is that this kind of marketing is old fashioned. It doesn’t work anymore. Your competitors believe that people will read their flyers and watch their commercials if they interrupt people’s lives often enough. But you know better, and you can’t out-gun them anyway. However, you are going to learn to tell your compelling story, and relate to your prospects as one human being to another. You are going to explore the blue oceans of permission marketing and people media and become expert at them. That’s because you know the day will come when these are virtually the only kinds of marketing that will exist. And you want to be way ahead of the curve. The era when the service motive replaces the profit motive may still be far off, but the traces of the emerging concept of enlightened self-interest are already appearing in marketing. Retailing can be fun again when it is driven by uncompromising integrity, a caring, service-minded attitude, and an outrageous degree of professional excellence. Beginning of a new series; The Seven Lost Secrets of Successful Furniture Promotions, updated for a digital new millennium.